This workshop manual is the most comprehensive manual available for repairing and maintaining your Land Rover Discovery. Suitable for the home workshop mechanic or professional technician this manual will help you repair and maintain your Discovery. Very easy step by step instructions with lots of diagrams. The following is a list of information contained in this Land Rover Discovery Repair Manual. All sections show how to remove, repair and replace the parts with full easy to follow instructions and detailed diagrams. Everything is in this Service Manual to help you troubleshoot problems, dismantle and assemble major components, repair and replace parts and maintain your Discovery. 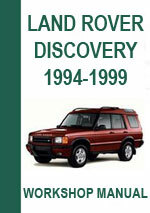 Land Rover Discovery 1994-1999 Workshop Service Repair Manual $9.99 Immediate Download!